For the last 3 years I’ve been using Atom for all my frontend related work, until last month when I decided to switch to VS Code. I really love Atom but it was becoming harder and harder to ignore the general slowness of the app and how much memory it was eating up. After hearing a lot of good things about VS Code I decided to download it and give it a try. Out of the box VS Code reminded me of WebStorm, bulky looking and a lot of UI I didn’t find useful. After playing around with the User Settings editor I was relieved to see you can customise pretty much all of the UI, but before I properly jumped in to customising everything I wanted to see if it could provide all the packages that I used on Atom. After a month of looking through various themes I found a pretty nice one called “Code Anxiety”. I’ve always used terminal for Git but the Git integration on VS Code (thanks to Git Lens) is actually incredible, really integrates nicely with my workflow. As you can see above I’ve focused on a clean UI, this is important to me as I can get really distracted when working, so hiding panels that I wouldn’t ever use was a must for me. 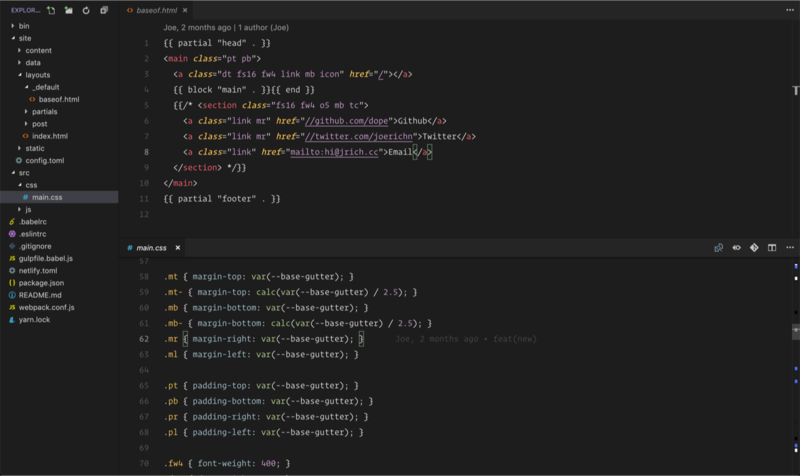 Short and sweet but overall I’m really happy with VS Code, it has all my favourite packages and more. Thanks for reading! If you have any packages you can’t live without, be sure to send me them on Twitter.